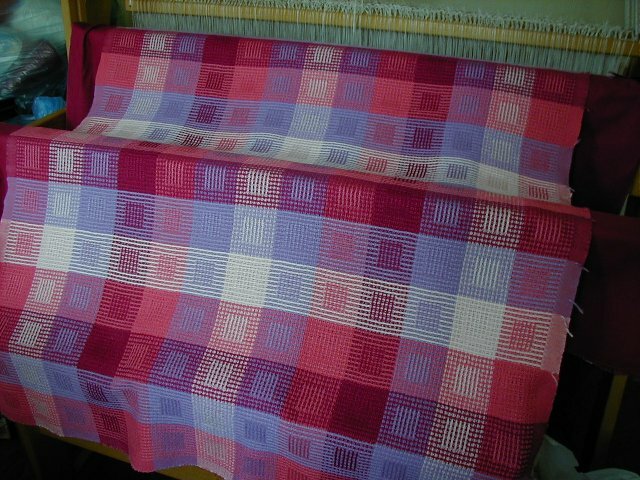 To see earlier projects, go to my main weaving page. Take a look at what the Berkshire Guild did at the Silchester Roman dig where we were demonstrating a warp-weighted loom as well as teaching low-whorl spindling and tabletweaving to visitors. 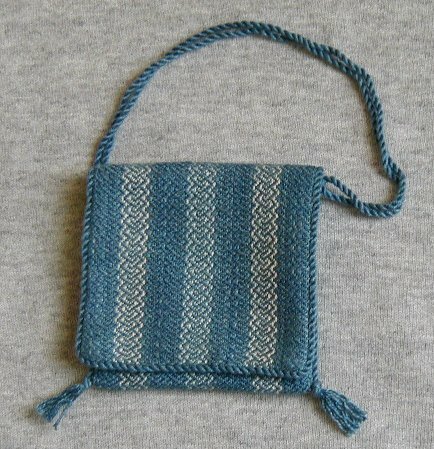 This bag is my first project woven with handspun yarn. I made it for an internet "small bag" exchange (it is 5" by 4"), but I've decided to keep it for myself, if I can get a substitute woven in time. The yarn was worsted spun from Wensleydale tops, 1750 ypp. I dyed it in 3 shades of indigo, because I wanted to submit it for the Kennet Valley guild's September challenge, to make something using 3 shades of the same colour. The pattern is a plaited twill. The cord is kumihimo - yatsu kongo. This is one of the bags I sent instead, using 30/2 silk which I also indigo-dyed. the dyeing is rather uneven, but I still like the bags, which are about 2.5" square. 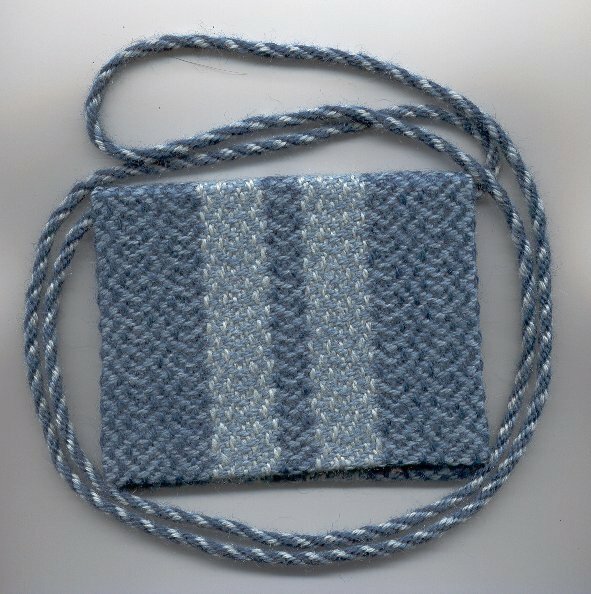 The pattern is almost the same plaited twill as the Wensleydale bag, but this time the cord is just twisted . This summer I made 2 baby blankets for a friend's daughters. They are both in 10/2 mercerised cotton. The first one is turned Atwater Bronson lace. Although the pattern looks quite complicated, it only needs 4 shafts!!! The other blanket is also Atwater-Bronson lace, this time in a dogwood pattern. Back to main weaving page.